At the Ramsey County Jail near downtown St. Paul, the guard really is changing. Former St. Paul Police Assistant Chief Matt Bostrom was sworn in as sheriff Tuesday, succeeding four-term incumbent Bob Fletcher. Both are long time fixtures in law enforcement in the East Metro. They were actually partners as the lead local police officials during the Republican National Convention in 2008, but they could hardly be more different. "I'm okay with being out of the headlines," Bostrom said. He's 49 and has been a cop -- like his dad before him -- for more than 28 years. He's known as a low-key, behind-the-scenes administrator. "The primary principles of what I'm about and what I believe makes great law enforcement is first and foremost making sure that you provide great community policing services," he said. "When you don't prescribe to a neighborhood how they can be safe. You work with them and you take that same principle and you work with law enforcement leaders throughout the region." It's a sharp contrast to Bob Fletcher, the man he's succeeding. Fletcher once ran for mayor in St. Paul and campaigned to repeal the city's gay rights ordinance. He brought that same high profile to the sheriff's office in 1995. He made headlines taking preemptive security measures at the Ramsey County Courthouse during the Sept. 11 attacks, and then launched his own weapons of mass destruction squad. In later years, he spearheaded a secret investigation into groups likely to demonstrate at the Republican National Convention, and sent his troops onto the freeways to crack down on texting drivers. But Fletcher drew criticism from state and local law enforcement, and scandal tinged his tenure, as well. Two of his ranking employees were convicted on federal corruption charges. A gang unit Fletcher helped found was shut down amid more corruption allegations. At one point, he was forced to order his own son arrested on a drug charge. Fletcher declined repeated requests for interviews on his 16-year tenure. He has returned to work as a ranking officer with the St. Paul police department where he worked before his first election. Bostrom was Fletcher's fourth opponent and the first successful one. Bostrom pledged during his campaign to clean up the department and live within its financial means. Fletcher battled the Ramsey County Board on finances regularly, and reported a quarter-million-dollar budget gap late last month. "Along the campaign trail, I mentioned that I am going to hold the line on the budget for two years, and that's what I'm going to do. I think its going to take several months to do a complete audit, and then let's run that for a few quarters," Bostrom said. But money won't be Bostrom's only concern. The jail he's in charge of has been the focus of repeated criticism for inmate deaths. They include the suicide of a Villanova history professor in 2003 and a triple murder suspect in August, as well medical-related deaths of prisoners in 2006 and 2007. 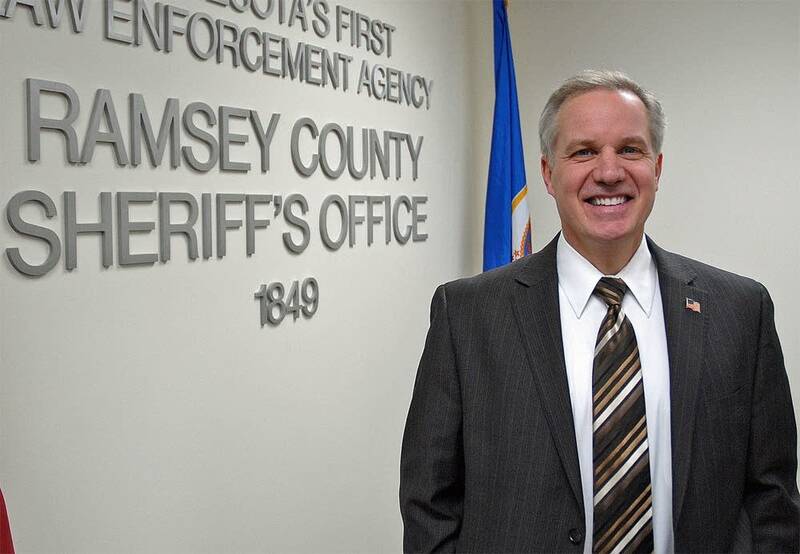 Bostrom says suicides are difficult to prevent, but he's ready to make changes. "One of the first orders of business for me is to look at how we're leading in that area, how we're selecting staff and then, what are expecations?" he said. "What are the practices and policies that we provide for our staff there? And at the same time, are there improvements we need to further make that facility safe?" Bostrom officially took over the office on Monday. His 500-person department covers about 500,000 residents. Bostrom's deputies also serve as the police departments for seven St. Paul suburbs including Shoreview, Arden Hills, and North Oaks.